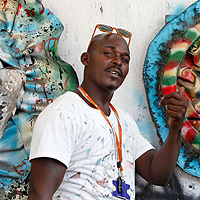 Louko was originally trained as a welder and in 2005 started working with Andre Eugene helping to make some of the monumental structures that tower over the neighbourhood. He then began to make his own work and at the time of his death in the 2010 earthquake had a strong body of work, with an imaginative use of the scrap metals found in the neighbourhood and making great use of his welding skills. �When I started making work I realised that I was having a hard time sleeping at night. I could not sleep is because I had so many works of art in my mind that I wanted to do. I told Andre Eugene about those dreams and thoughts. He shouted back, �don�t worry you will get your chance to bring those dreams to life soon�.